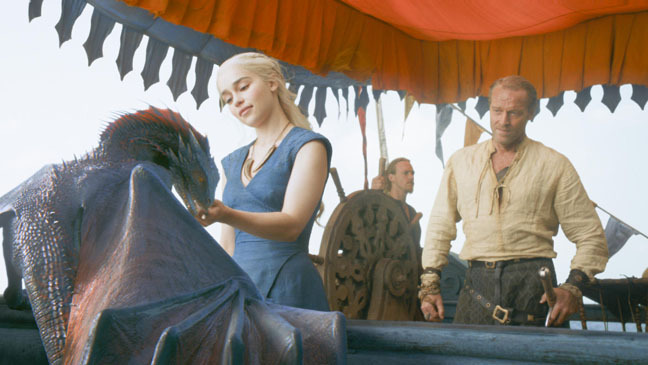 Nothing has slowed down or become redundant with HBO’s flagship series, ‘Game of Thrones‘ Season 3. Based on George R.R. Martin’s third book ‘A Storm of Swords‘, showrunners David Benioff and D.B. Weiss have decided to split the book up into two seasons, which is no easy feat, considering the amount of information in the book and the strategy of where to place certain story arcs. Luckily for us, everyone involved from the cast and crew of the show have flawlessly executed every aspect of the series. From the casting choices to the sets, everything seems to fall into place perfectly, and leaves us wanting more with each episode. The third book as well as the third series has some pretty infamous moments in it. There is the infamous ‘Red Wedding’, which sent fans of the story into an emotional frenzy for weeks on end. There is also Jamie Lannister’s current ailment as well as his confession to Brienne, which hits you like a ton of bricks. And of course, there are plenty of deaths, rises to power, and of course dragons, zombies, and the dreaded fear of Winter. There is such a large amount of information to give away in this third season, that we would be here for two days straight and still not be done with it. But with the creative counterparts that keep making this show as perfect as it is, we are given ample time with each character to follow them on their dangerous journeys. And that is a great accomplishment, as most television shows don’t give us that treat. That being said, I wish we had more time with each character. I know that sounds counter-productive, but even though we are given a great amount of time with them, the show is done so well with rich story lines, we only want to be with them more, which is a good problem to have, as we think about these characters from week to week, salivating until the time we meet with them again. This hits even more so with this third season, as the stakes are rising, and time is running out before Winter. Season 3 will change the game constantly throughout each episode as we see some of our favorite characters get into some dire situations that will have sever consequences on future episodes and seasons. This ten episode season is by far my favorite so far, but it seems to just get better and better with each season moving forward. This series must be watched, as it is perfect on every level. You would be doing yourself a disservice if you haven’t watched these yet. I highly suggest you do so. 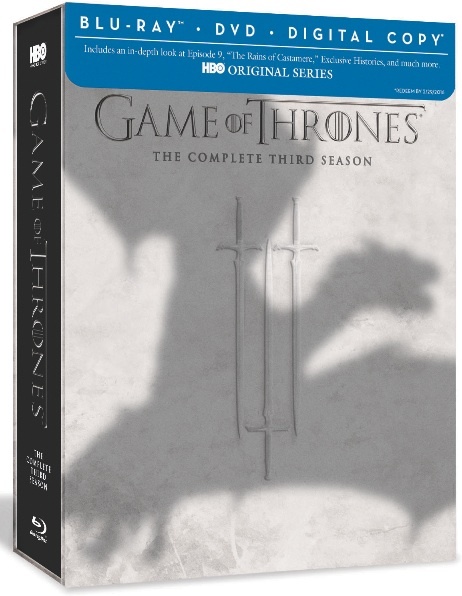 ‘Game of Thrones’ Season 3 comes with a demo worthy 1080p HD transfer and is presented in 1.78:1 aspect ratio. The detail of the image is very sharp with well-defined closeups of the actor’s faces, showing scars, individual hairs, and makeup blemishes. The costumes and props also look perfect, as we can make out every imperfection and spec of dirt, as well as individual stitching in their clothes. This also provides a great deal of depth to the vast locations that this cast films in, which is all over the world. It’s simply beautiful, and at times will take your breath away. From the snow mountains to the grim forests to sunny sand dunes, and even the rich look of King’s Landing, all looks magnificent. The colors are perfectly saturated as they stay true the nature of the story with darker and grayer tones everywhere. It’s is if Winter is already here and there is a creepy presence about. Nothing is cherry or particularly bright here, but it all looks amazing. The black levels run deep and inky with skin tones looking perfectly natural. There are no instances of any compression issues or any other problems with this video presentation. Simply phenomenal. This release also comes with a an impressive lossless DTS-HD 5.1 audio mix. The dialogue is always crystal clear and easy to understand. It is perfectly situated on the center channel and often has some great directionality to it, which fully immerses you in any scene. The sound effects and ambient noises are killer and pour out of the surrounds with ferocity and power. You will hear every clank of armor, every sword hit, bone crunch, and crow caw perfectly. The dynamic range is very wide with great highs and lows. And yes, at times the bass will kick in and rumble with grace, never being to overly dramatic. The score always adds to the suspense and emotion of each scene, without drowning out any of the dialogue or sound effects. There were no pops, cracks, or hissing to speak of, which makes this audio presentation top notch. Audio Commentaries – There are twelve in depth commentaries, meaning that is more than one per episode, excluding the first episode. These commentaries by the cast and crew of the show are very informative, fun, and offer tons of cool anecdotes, information, and great behind the scenes info. Each commentary track is a must-listen for any fan of the show. These are slowly becoming my favorite commentaries. If you ever wanted to know how they made an episode, this is where to learn about that. In-Episode Guide – Each episode as an option for this extra, which I highly recommend you do at some point. By pushing a button, you can lear more about each character, location, land, and history of each Kingdom. You will get a plethora of pop-up texts on screen of facts as well as animated history lessons by the characters in their voices as it relates to each scene. Simply amazing. A Gathering Storm (14 mins.) – Here is a great extra that features interviews with the cast and crew, as they discuss the key plot points and scenes that lead up to season three. So if you need some refreshing on ‘Game of Thrones’, click this extra before you start watching this season. New Characters (10 mins.) – Here we are introduced to all the new faces for season three. Get to know them well. The Rains of Castamere Unveiled (48 mins.) – This is an awesome extra, which is a Picture-in-Picture experience on the episode ‘The Rains of Castamere’. You will be treated to interviews, on-set footage, and behind the scenes segments. You will see just how much goes into make an episode. This is a must-watch. Deleted and Extended Scenes (14 mins.) – There are five scenes total and all are worth while. This was just a time constraint issue. The best one here is the scene between Tywin and Pycelle, which I have watched numerous times. Histories & Lore – There are sixteen different segments, which are animated stories that are read in the character’s voices. The cover the history, legends, and locations of all the kingdoms and key events. Roots of Westeros – Here is another animated story segment that focuses more on the characters and their relationships with one another. This is also narrated by the characters of the show. Inside the Wildlings (6 mins.) – Here is a fun extra with the cast and crew discussing the Wildings of the show and their how they live. We find out about their culture and the main characters. The Politics of Marriage (9 mins.) – This is funny. 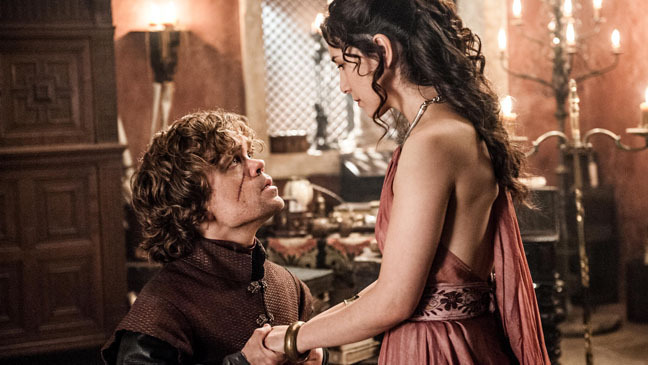 The cast and crew discuss the ins and outs of getting marriage and relationships in the land of Westeros. 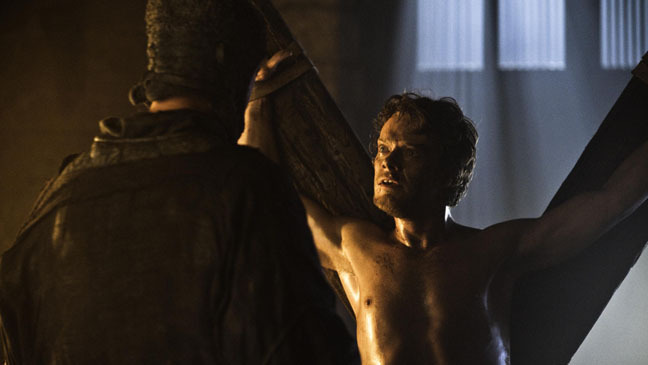 ‘Game of Thrones‘ is one of the best shows on television. Hell, it might be one of the best shows ever to grace the small screen. Every episode, character, and plot are terrific and executed flawlessly. And HBO has once again knocked this blu-ray set right out of the park with perfect video and audio presentations and a treasure trove of excellent extras. When you purchase this blu-ray set, not only do you get the blu-rays, but you will get the DVD’s, and the digital copies. HBO is as good as Criterion when it comes to releasing home video. There. I said it. This blu-ray set is a MUST OWN! This entry was posted on Tuesday, February 18th, 2014 at 10:51 am	and is filed under News, Television. You can follow any responses to this entry through the RSS 2.0 feed. You can skip to the end and leave a response. Pinging is currently not allowed. « Here’s The Amazing ‘Guardians of the Galaxy’ Trailer!! !